The Mamelodi Sundowns coach and Orlando Pirates attacker have won the Absa Premiership accolades for February. 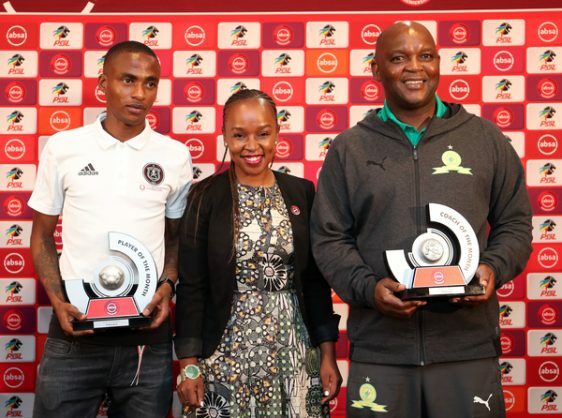 Mamelodi Sundowns coach Pitso Mosimane and Orlando Pirates attacker Thembinkosi Lorch have won the Absa Premiership Coach and Player of the Month accolades for February respectively. “Jingles”, as Mosimane is affectionately known in football circles, was selected the best coach for the month following the club’s impressive run of form which saw them go atop the Absa Premiership standings at the end of February- a period where they gathered eight points. Mosimane’s Mamelodi Sundowns side enjoyed big wins over Black Leopards and Cape Town City, collected a point each away at title challenging rivals Bidvest Wits and when they hosted Polokwane City, while they lost to AmaZulu during the period from January 29 to February 27. During this time, Sundowns scored eight goals and conceded four. Chippa United’s Clinton Larsen and Kaitano Tembo of SuperSport United were close on the heels of Mosimane in getting the award. They were both praised for the brilliant work produced at their respective teams during February. Lorch, 25, who has come close to snatching the award in previous months during this current campaign, finally got his maiden honour owing to his tremendous display for his club in February. He stood head and shoulders above his colleagues and contenders for the player award. Players such as Lebogang Maboe of Mamelodi Sundowns, Chippa United’s Gladwin Shitolo, and Cape Town City captain Thamsanqa Mkhize were nominated for their impressive efforts in their respective teams. The Bloemfontein-born Lorch was rewarded for his undeniable consistent form during February, during which he scored a crucial goal in the Soweto Derby and provided two assists in Pirates’ other matches during the month.